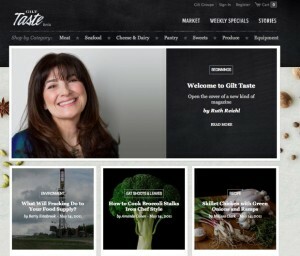 The idea behind Gilt Taste is to offer luxury and artisan foods without becoming a paid members-only club. Additionally, products are complemented by recipe ideas, weekly specials, investigative journalism, and introspective pieces written by well-known guest bloggers. "The onus is on us to make sure that it’s all great, that what we’re selling is really great in addition to the content that we’re putting up around it,” said Reichl. "For somebody like me, who comes from a traditional print background, that’s really new." As of now, shoppers perusing Gilt Taste will find a Memorial Day sale of live Maine lobster paired with a fresh lobster roll recipe written by New York Times food columnist Melissa Clark, an essay about mushroom foraging by blogger and cookbook author Hank Shaw, and an intimate confession of a self-proclaimed "chocolate hater" from New Yorker writer Lila Byock. Says Food & Wine editor Dana Cowin, "Gilt Taste has put together a group of some of the smartest people in the foodie intelligentsia. I expect high quality, tremendous thoughtfulness, and extreme deliciousness from them."